The Atlas of a 1000 Ancient Genomes Project is a collaborative, multidisciplinary effort of researchers from the Swedish Universities of Stockholm and Uppsala with contributions from institutions and partners worldwide. It aims at unravelling human prehistory by combining state-of-the-art molecular and population genomics approaches with bioarcheology; understanding the mechanisms leading to demographic and evolutionary changes and lastly creating a detailed catalogue of ancient human genetic variation. The 1000 Ancient Genomes Project builds upon the ATLAS of ancient human genomes in Sweden project and enlarges its geographical scope beyond the borders of Scandinavia into the whole of Eurasia. The Atlas of a 1000 Ancient Genomes Project will set new standards in ancient DNA research and open new horizons and for a comprehensive understanding of human evolution, demography, diseases and adaptation. We published new findings on the demographic history of ancient Scandinavians from the island Gotland. The publication can be found here. Our recent findings on the evolution of Scandinavians are nicely summarized in a video by the Knut and Alice Wallenberg Foundation. It is published in English and in Swedish. We met for an end-of-the-year ATLAS gathering in Nynäshamn. A short meeting summary can be found here. We published new data over summer. Please find our latest papers here. We have a new publication in Scientific Reports. We analyzed 41 complete mitochondrial genomes of ancient humans from North Asia and showed a pattern of long-term genetic continuity in the region. We further detected signatures of gene flow or population structure, altogether highlighting the complexity of human demographic history. The group had its annual retreat. This time we went to Gimo Hergård and some impressions from the meeting can be found here. Members of the ATLAS team were involved in a multidisciplinary study highlighting the temporal genetic changes caused by prehistoric migrations into Iberia. The analyses of ancient human remains shed light into the origin of farming life-style in the far west of Eurasia and showed surprising homogeneity in diet over time. The study is published ahead of print in PNAS. There is an open vacancy as Head of the SciLifeLab's National ancient DNA center. Please see the following job advert for more information. 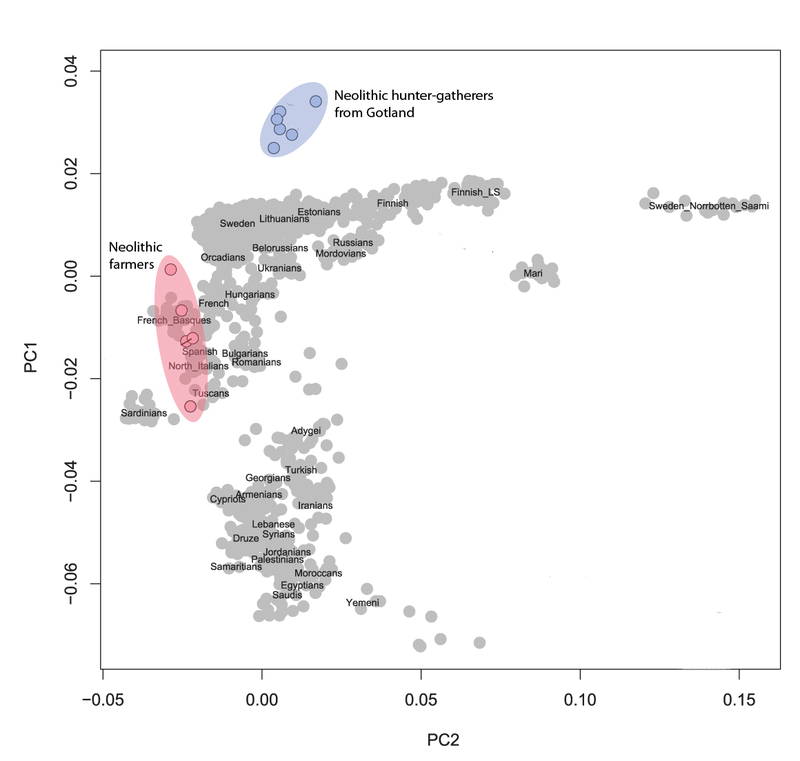 We just published new insights into Mesolithic Scandinavians in PLoS Biology. We confirmed two migration routes building the foundation of the diverse Mesolithic human population in Scandinavia and also identified loci that have been selected for in the process of adaptation to the Northern environment. A 3 episode TV show was broadcasted in Swedish television over Christmas, focusing on the life in the Iron ages in Scandinavia. Some of us have been directly involved and others contributed to the success of the show with their research. The show can be found here (in Swedish) and Anders commented on the show in his blog. Magdalena and others from the team published a new study in the Journal of Archaeological Science: Reports. The multidisciplinary study sheds new light in the genetic composition, the diet and culture of the Fennel beaker culture on Gotland. Happy new year to all of our team members, families, friends and collaborators. We published a new study in Current Biology investigating the origin of the aboriginal inhabitants of the Canary Islands (Guanche). By leveraging genomes of 11 ancient Guanche individuals we showed a close relationship of them to extant Northwest Africans and leaving up to 30% of genomic ancestry in today’s Canary islanders. Congratulations! On 5th of October the Knut and Alice Wallenberg Foundation announced this year's awardees. Mattias, Jan and Anders secured a prestigious grant from the Knut and Alice Wallenberg Foundation. It is one of Sweden's largest private foundations and supporting the team's research on 1,000 ancient genomes for the next 5 years. The official announcement from the foundation can be found here. Uppsala University has released a statement that can be read (in Swedish) here.